Hawgfly is creating FX Makeup, Cosplay, Makeup/Hair, Props and Costumes! Thank You! for checking out Hawgfly Productions on Patreon! Hawgfly is based in Austin, TX and creates custom designs and makeup effects for projects of all levels. We have worked on numerous films (Stoker, Blood Fest, Machete, and Machete Kills to name a few), television (including The Son, The Leftovers, The Long Road Home) and countless short films, commercials, photo shoots, and demos. Check out the website, www.hawgfly.com, to see our work! Hawgfly was started in 2004 by Meredith Johns and Carolyn O’Hara, but we wouldn’t be able to survive without our amazing crew. Anna Fugate-Downs, Jason Vines, Erin Klarer, Sylvia Ramos, Octavia Lutgen and Calynn Lechner complete us and help round out our awesome company of artists. 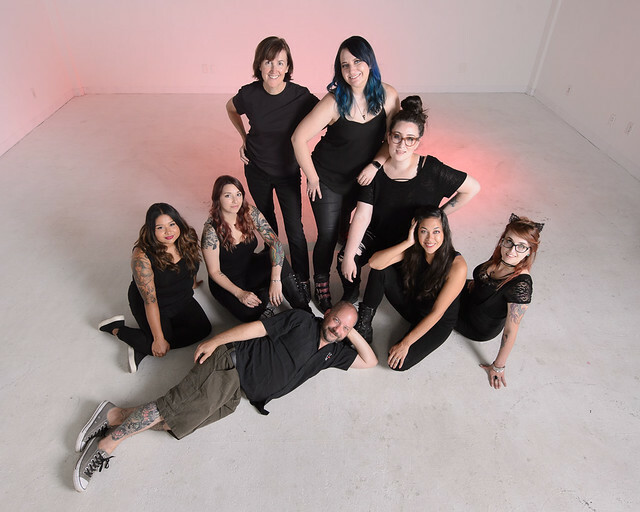 Our talented team of professionals is a blend of makeup and hair artists, FX makeup artists, costumers, sculptors, mold makers, puppeteers and fabricators. We love our job and live to create works of art that challenge our creativity and ingenuity. Our designs incorporate custom makeup techniques, cutting-edge 3D printing elements and any new innovative technology we can get our hands on. Our goal is to create unique characters and photo-realistic effects that thrill audiences and clients all over the world. We're launching this Patreon with a specific goal in mind - taking Hawgfly to the next level with your help! Create original characters and makeup FX projects all while sharing the process with our Patrons. Develop a community of fans, artists, designers, cosplayers and genre movie lovers who want to know more about the techniques, tools and creative process behind ambitious creature and character makeup work. Connect with artists and fans all over the world and meet potential collaborators worldwide who share our passion! The Hawgfly Patreon is an ongoing production diary of our unique characters and creations, revealing a behind the scenes look at the tools and techniques used in the Hollywood-level genre movies, characters and effects. With frequent updates of photo tutorials, candid in-progress pics, videos from our workshop and details of the production process from concept to delivery, you'll get a unique insight into what makes Hawgfly so special. Thank you for the love and support! We appreciate you and thank you from the bottom of our Hawgfly hearts! You also gain access to Patron Only content and can get a taste of all that we have to offer! 10% OFF Halloween Makeup/Costume Services! An additional 5% off! You get 15% OFF Halloween Makeup/Costume Services! even more of a discount! You get 25% OFF Halloween Makeup/Costume Services! These exclusive videos go in-depth on what we do here at Hawgfly - Makeup, Weapon Making, Costumes & More!! Every month or so, the Hawgfly Team will tackle a BIG PROJECT! This project will be a special build.... a unique project that will put our skills to the test. The BOSS HAWG Project membership tier is a chance for ONE Patron to not only help choose what the project will be, but keep it for themselves! That’s right, we will create a custom piece just for you! Weapons, Costumes, special props and wigs, anything is possible! While all our Patrons will get to follow the creation of this project, the BOSS HAWG gets to not only vote on what it is, but in the end they get to keep it!